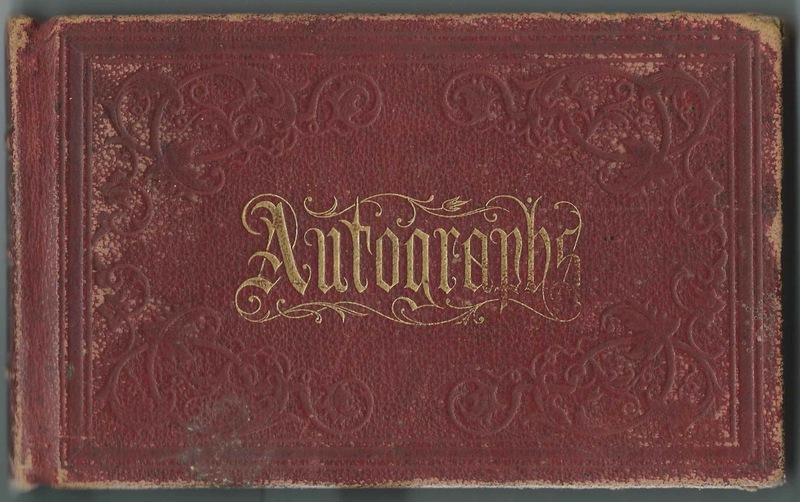 Autograph album with inscriptions acquired at Eastman National Business College at Poughkeepsie, New York by a student, presumably Allen Tibbits Cook of Warsaw, Indiana. 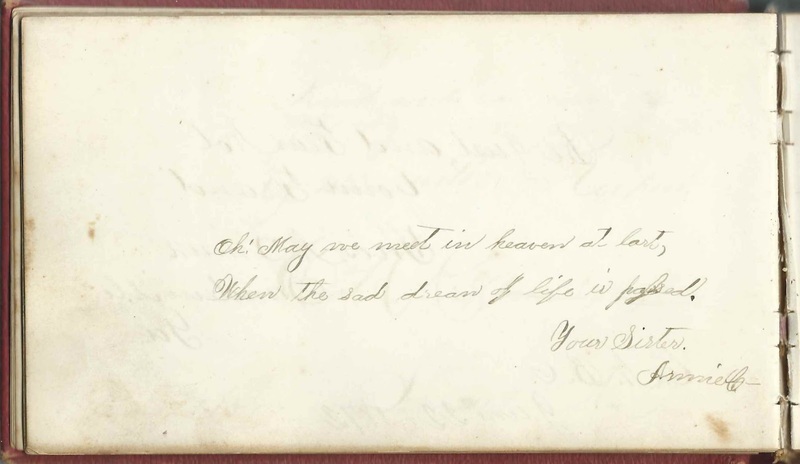 His initials and surname appear in the upper right corner of the page shown below. 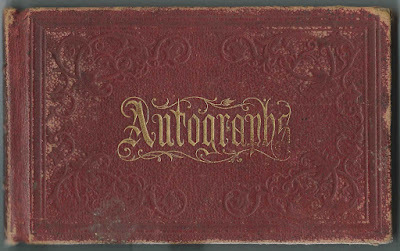 The album measures approximately 7" by 4" and is thicker than usual, with nearly 150 pages inscribed by Allen's relatives and fellow students, though some of them inscribed more than one page. An alphabetical surname list and an alphabetical list of the inscribers, together with any personal information they offered, appear at the end of this post. The album contains an engraving of the residence of Harvey Gridley Eastman, founder of the college, as well as an inscription by him. The stamp of the Kosciusko County Historical Society of Warsaw, Indiana, on the inside back cover. The album was apparently deaccessioned, as the number is crossed out, and the album subsequently sold online, where I purchased it several years ago. 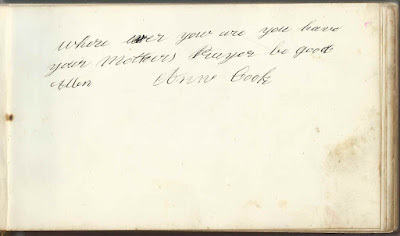 Allen Tibbits Cook was born September 22, 1849, the son of John Woolson Cook and Ann (Pittenger) Cook. 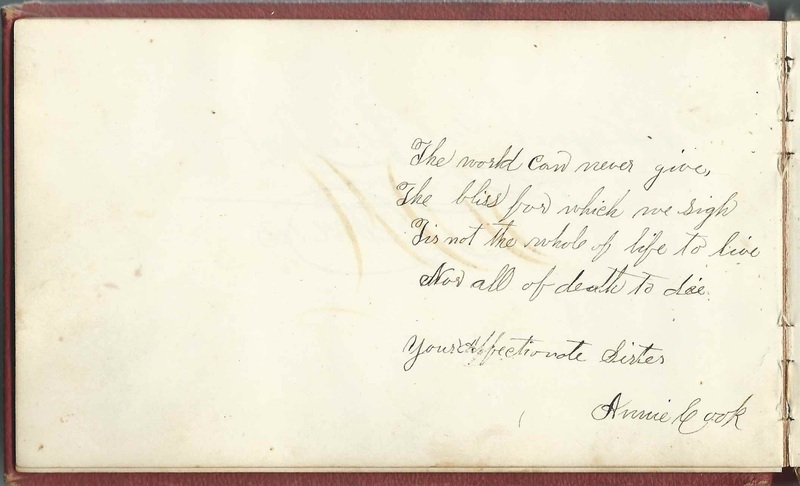 Ann inscribed the first page in the album; John inscribed a page near the middle of the album. About 1877 Allen Tibbits Cook married Cora Belle Irwin, daughter of Thomas and Mary (Smith) Irwin. By 1880, Allen and Cora were farming at Warsaw, Indiana; they raised several children. Cora died in 1927 and Allen in 1934. They're buried with many family members in the Oakwood Cemetery at Warsaw, Indiana. If you have corrections and/or additions to the information above, or comments on any of the inscribers listed below, please leave a comment or contact me directly.
? 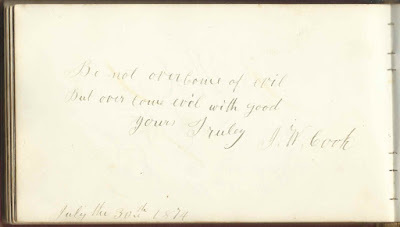 of Selma, Alabama, inscribed at Eastman National Business College on July 2, 1872. Possibly J. J. Fellows, which might be Jonathan J. Fellows of Selma, Alabama, but could also be Bellows or ? 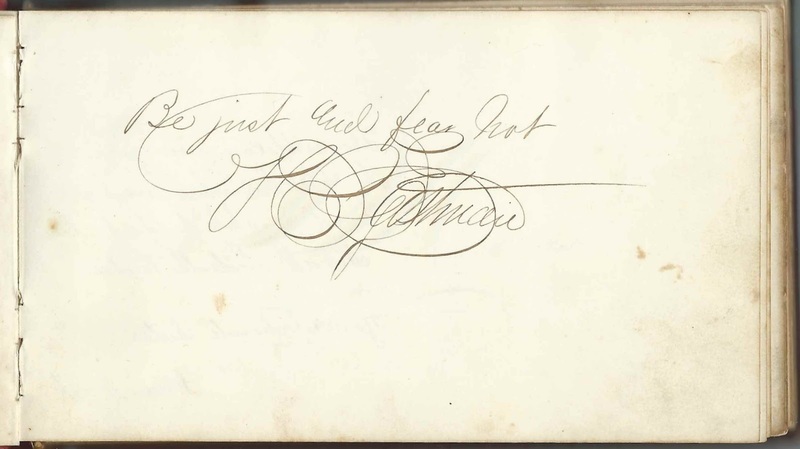 S. H. Atwater of Windham, New York, inscribed on August 1, 1872, C.C. 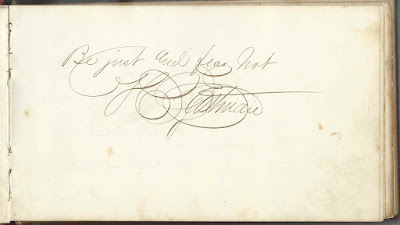 C. Boyd of Parkers Landing, Pennsylvania, inscribed at Eastman National Business College, on October 10, 1872; middle initial possibly M. or W.
Cass of East Troy, Wisconsin; initials too ornate to determine, but possibly A. J.
J. W. Cook, inscribed on July 30, 1874. 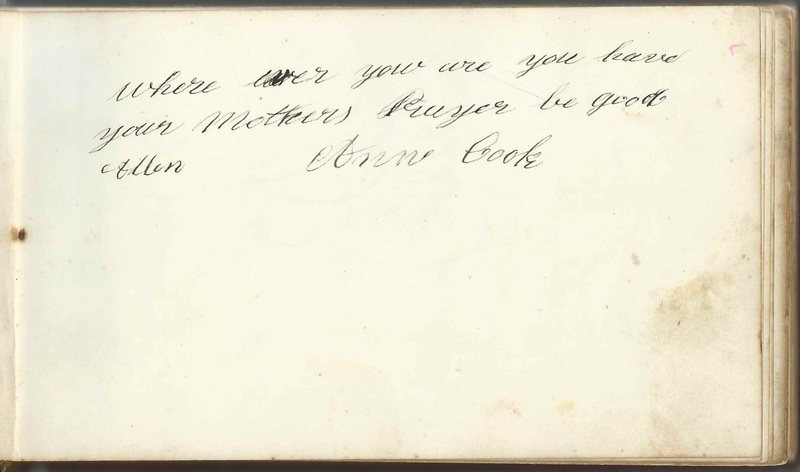 Presumably John Woolson Cook (1814-1886), father of album owner Allen Tibbits Cook.
? 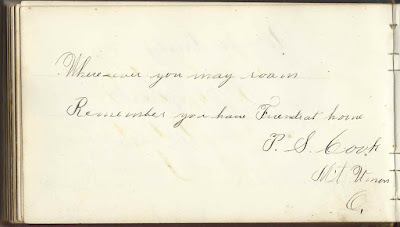 D. Crippen of Seward, New York, inscribed on October 11, 1872. Could be the O. D. Crippen of Seward, New York, inscribed another page. 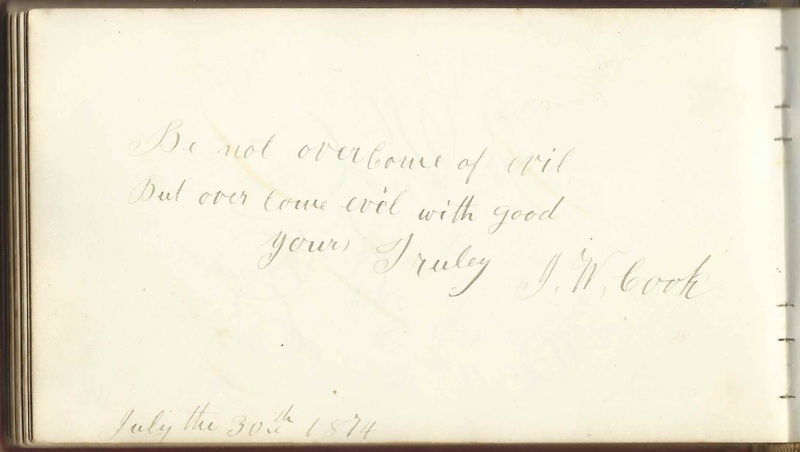 Henry I. Dudley, or Henry J. Dudley, of North Leverett, Massachusetts, inscribed on October 4, 1872, C.C. 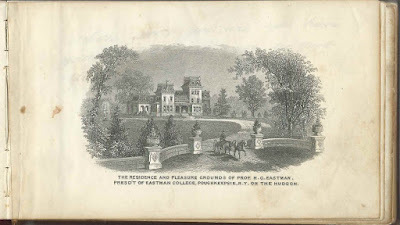 & C. of L.
H. G. Eastman; presumably Harvey Gridley Eastman, founder of Eastman Business College [or Eastman National Business College] at Poughkeepsie, New York. Cousin of George Eastman. Gansky Eshizawa of Yokohama, Japan, inscribed at Eastman National Business College. He also wrote two lines in Japanese. 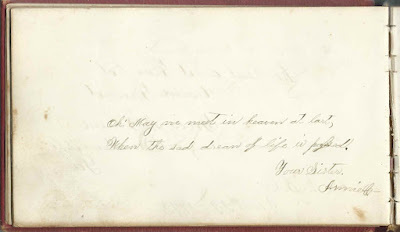 T. R. Hannah of Dawson, Georgia, inscribed at Eastman College on July 20, 1872; not sure of middle initial. E. A. Hill of Windham Center, can't read initials for state, possibly New York or New Jersey or New Hampshire or ?
? Perry of Union, West Virginia, inscribed on July 15, 1872; not sure of initials but possibly F M. or J. M.
J. W. Prouty of Wilmington, Vermont, inscribed on May 24, 1872, C.C. & C. of L.
J. 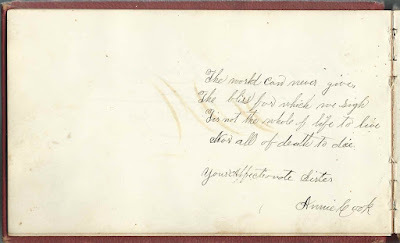 A. Quinn of Buck Mountain, Pennsylvania, inscribed at E.P.D. on "6-5-72"
J. C. Shelton of Bridgeport, Connecticut, inscribed on "8.3.72", C.C. 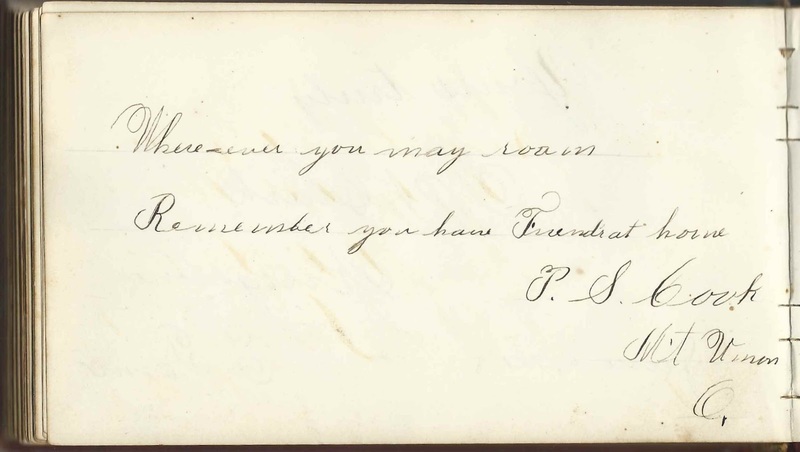 George B. Tanguy of Logansport, Indiana, inscribed at Eastman National Business College on July 28, 1872. C.C. 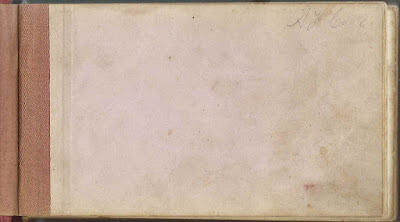 and C. of L.
Unger of Shoemakersville, Pennsylvania, inscribed on May 16, 1872; not sure of initials, but possibly A. F.
Cowgill Wilson of Portland, Indiana, inscribed at Eastman National Business College on June 27, 1872. "As From One State We Came, As Friends We Shall Remain"